solution. eating dental or skeletal Class IIs still remains a major headache for orthodontists.However, two major schools of thought are occasionally in contention: maxillary retraction or mandibular advancement. What needs to be done? What can we use? 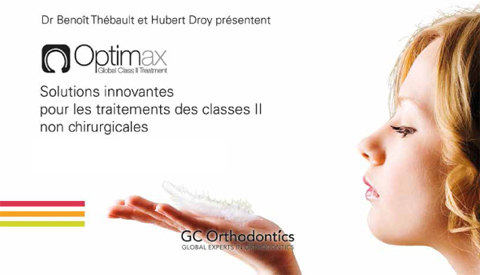 Twenty years experience of orthodontic practice have enabled us to devise the Optimax system. Comprising three different appliances: Optimax Distaler, Optimax Lab and Optimax Fix, the Optimax Global Class II Treatment system is used in combination with conventional or more recent orthodontic techniques (TADs) to offer a solution capable of dealing with most Class II treatment indications. Mechanics: the search for a coherent system! Mechanics : what can we expect of a removable mandibular bite-jumper? Mechanics : what can we expect of a fixed mandibular bite-jumper? Hubert Droy, a dental prosthetist with 15 years experience in orthodontics has been constantly researching the use of conventional appliances. Drawing on feedback from orthodontists and his own ideas, he first devised, in 2007, an innovative; compact mandibular propulsion system, Optimax Laboratoire, to be used in conjunction with multibrackets and which gave top priority to the physiology of mandibular movements. Since 2009, he has been collaborating with Dr Benoît THEBAULT, helping to sustain the development of Optimax Lab and design Optimax Fix, a product dedicted to multiattachment appliances. Distalization still remains essential, however, and thanks to the acknowledged expertise of Dr THEBAULT in designing and using temporary anchorage devices (TADs), a new product, the Optimax Distaler has been developed to enable immediate distalization of the maxillary and/or mandibular lateral segments without the need for prior leveling.